Drama; 1995; 136 minutes; Color. Available from Amazon.com. This film is an adaptation of Jane Austen’s classic novel about the role of romance and money in English upper-class society of the 19th century. Selected Awards: 1996 Academy Awards: Best Writing; British Academy Awards:Best Picture, Best Actress (Thompson), Best Supporting Actress (Winslet); 1996 Academy Awards Nominations: Best Picture, Best Actress (Thompson), Best Cinematography, Best Supporting Actress (Winslet), Best Costume Design, Best Music; British Academy Awards Nominations: Best Cinematography, Best Supporting Actress (Spriggs), Best Supporting Actor (Rickman), Best Adapted Screenplay, Best Director (Lee), Best Costume Design, Best Music; Best Make-up. This film won many additional awards. Featured Actors: Emma Thompson, Kate Winslet, Alan Rickman, Hugh Grant. MINOR. The portrayal of the male characters in the film is different than in the novel. See the Helpful Background Section below. Review the Helpful Background Section and talk to your child about Jane Austen’s portrayal of men in her book and the portrayal of men in the movie. Pay particular attention to the changes in the society shown by these differences. Review the section entitled Before Seeing the Film in the Learning Guide to “Pride and Prejudice” and communicate as much of the content as possible to your child. You will not be able to cover everything but do the best you can. Immediately after the movie, or at odd times over the next week (for example at the dinner table or in the car on the way to school) bring up some of the Discussion Questions, starting with the Quick Discussion Question in the sidebar. Don’t worry if you can only get through a few questions. Just taking the film seriously and discussing it is the key. Allow your child to watch the movie several times and continue to ask and help him or her answer more discussion questions. The screenplay for the movie gives the male characters added color and dimension by inserting scenes not found in the book. For example, the scenes in which Colonel Brandon rescues Marianne, makes gifts of the pianoforte and the flowers, embarks on an emergency mission to bring Mrs. Dashwood to Marianne’s sickbed, and later dramatically reads poetry to Marianne, all were added by the screenwriter and do not appear in the novel. Edward Ferrars’ friendship with Elinor’s younger sister, Margaret, is also an invention for the film, as are Ferrars’ several unsuccessful and emotionally tumultuous attempts to explain himself to Elinor. Each of these scenes show emotionality in a male character that is missing from the book. Austen’s novels were a conservative reaction against the romantic literature of the early 1800s. Her male characters were emotionally undemonstrative. However, repressed males are not respected by modern mass audiences. Their appearance in the film would have prevented moviegoers from identifying with the male characters in the story. While the film adaptations of Austen’s novels reject Austen’s view of the way men should act when courting, these changes may provoke interesting discussions with children concerning how courtship rituals and expectations for behavior change over time. See expanded discussion in Learning Guide to “Pride and Prejudice”. Masculine emotionality is at odds with Austen’s own critique of sensibility. In the modern day version of these characters, it is clear that “sensibility” has triumphed over the “sense” that Austen sought to champion. Who was “Miss Sense” and who was “Miss Sensibility” in this film? Which one had the right approach? Elinor is Miss Sense and Marianne is Miss Sensibility. According to the movie and the book it was Elinor who had the right approach. 1. Should Willoughby have permitted his need for money to triumph over his love for Marianne? Was he acting with “sense” when he did this? Or was it mere cupidity? 2. Was the Edward Ferrars character acting foolishly when he was prepared to honor his promise to Miss Steele despite the fact that he was in love with Elinor? In the modern view, Ferrars would simply have terminated the engagement, proposed to Elinor and there would have been no novel and no film. Which do you think is the better way to resolve this dilemma, the one proposed by Austen in which honor would have required Ferrars to marry a woman he did not love or the modern solution in which Lucy Steele (had she remained true to Edward) would have had her feelings badly hurt? 3. Discuss the differences between the accepted courting behavior outlined in the Austen novels and that shown in the film adaptations (see discussion in Helpful Background section above). 4. Marianne and Elinor often were in conflict with each other, and yet they loved each other very much. Can you explain this dynamic? Discussion Questions Relating to Ethical Issues will facilitate the use of this film to teach ethical principles and critical viewing. Two of the ethical concepts raised in the film are set out below. 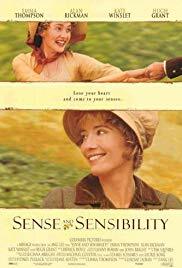 For Parents: Encourage children to read Sense and Sensibility after seeing the film. The book is much more detailed than the film and contains subplots and descriptions not seen in the film. Perhaps the two of you could read it together and discuss your reactions as you go along. Other excellent film adaptations of Jane Austen novels include Pride and Prejudice, Emma, and Persuasion. online text of Sense and Sensibility with a search function from the Republic of Pemberley. “Emma Thompson’s Sense and Sensibility as Gateway to Austen’s Novel” contained in Jane Austen in Hollywood, Edited by Linda Troost and Sayre Greenfield, 1998, University of Kentucky Press.